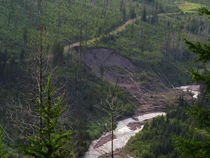 University of Montana researcher Diana Six and others fault logging as a misguided substitute for the natural forest thinning being conducted by beetles. In the journal Forests, Six and fellow researchers find the U of M, the Forest Service and others have failed to report failures of logging to maintain resilient trees while beetles have an innate ability to retain the most adaptive trees as they conduct nature's thinning. They caution that misguided attempts to "do something" may simply over-log forests and point to research finding unlogged stands of both spruce and ponderosa pine have retained more live trees after beetle attacks than mechanically thinned stands. They conclude "The manner in which policy makers have accepted beetle timber harvest treatments as a panacea for responding to bark beetle outbreaks in North American forests raises a number of red flags. . . It is perhaps no accident that the beetle treatments that have been most aggressively pushed for in the political landscape allow for logging activities that might provide revenue and jobs for the commercial timber industry. . . management should be led by science and informed by monitoring." Click here for a summary article of Six's research in Mother Jones. Click here for the paper by Six, Biber and Long in the journal Forests.